The next logical step to make sausage is to get your spices measured and mixed together with your ground meat. The sausage spices, of course, will vary with the recipe you have chosen and the amount of meat you are making into sausage. In this example I made fresh hot Italian sausage. I started with a recipe for 2 lbs., and multiplied the amounts by 3.5 to get the correct total for the 7 lbs. of meat that I ground. Because this was a batch of fresh sausage, I did not have to measure and add any cure. This recipe called for cracked fennel, kosher salt, fine ground black pepper and red pepper flakes. You can see that all the spices are in bulk sized containers (much cheaper to buy). All of the spice measurements were given by volume instead of weight, so I measured them out with standard teaspoons and tablespoons. 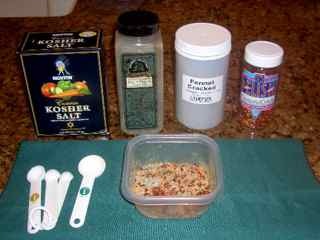 I measured all the spices into a container. 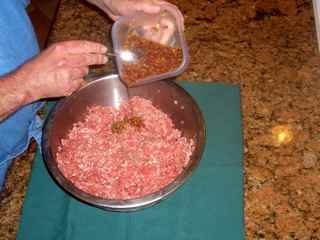 That's the best way to make sure they are well mixed together before you put them into the ground meat. Here I'm pouring the spice mixture into the ground and cooled sausage meat. I add ice water to the spices to make them easier to mix evenly into the meat. The ice water also lowers the temperature of the meat just that little bit more. I use about 1/2 cup of water for every 5 lbs. of meat, and it has no adverse effect on the finished sausage. As a matter of fact, it makes it a little easier to stuff into casings. The only way to really make sure you have evenly distributed your spices through the meat is to get in with your hands and do a thorough job. Be sure your hands are very clean, of course. You may even want to wear a pair of disposable plastic gloves for this part of making sausage. For a batch of sausage this small, everything will be well mixed in just a couple of minutes. At this stage of the process, its still not too late to adjust your spices if they aren't to your liking. I always make a small patty from the finished sausage and fry it up to make sure it tastes the way I want it to. Add more spice if you think the mixture needs it, but be careful. One of the rules to make sausage is that the spice flavors will meld and intensify a bit after the meat has rested for a while. Isn't sausage making simple so far?